South Beach in the late 70s. Before the city of Miami Beach became a hotspot for nightlife and celebrities, it was home to a massive Jewish retiree population. It's estimated that 20,000 elderly Jews made up more than half of the beach's population in the late 1970s. 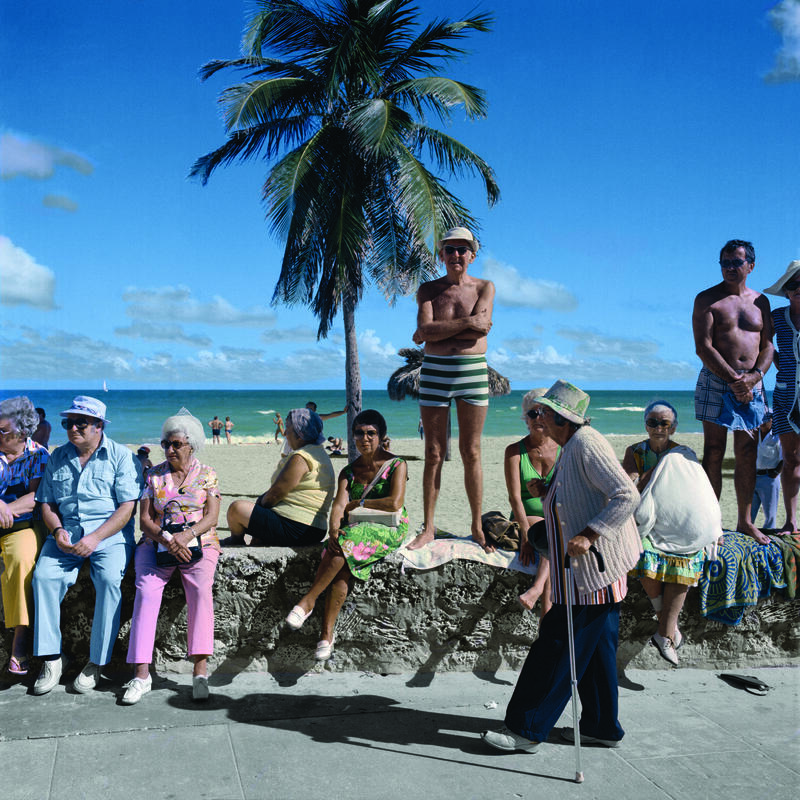 This era in Miami's history and the experiences of the Jewish community is the focus of a new book of photography entitled "Shtetl in the Sun: Andy Sweet's South Beach Photography 1977-1980." Iconic Miami Beach photographer Andy Sweet documented many of the middle class Jewish families that called Miami Beach home before he was murdered in 1982. His photographs, along with those of photographer Gary Monroe, are also the focus of a new documentary, entitled "The Last Resort". The film is premiering in South Florida this weekend with a number of showings across the region. We spoke with reporter Brett Sokol, who edited the book of photography, and filmmaker Dennis Scholl about this era of Miami Beach's history. An interview with writer Brett Sokol and filmmaker Dennis Scholl. SOKOL: One of the reasons why I thought it was so important to put this book out and why I'm thrilled that this documentary film also capturing Andy Sweet's work is out is because it really fills in this chapter of Miami Beach history and really of Jewish culture that I, as a Jew, didn't even really know much about. I moved down to Miami Beach in 1999 and like so much of the rest of this country I had a wrong take on what Miami Beach was like before its current renaissance. We know what Miami Beach was like in the 50s and 60s with Frank Sinatra and Dean Martin at the Fontainebleau. And we know what happened in the 90s, this transformation of South Beach and the fashion industry and it becoming a playground for celebrities. But we didn't really know was what happening in between. Particularly in the 1970s and "God's waiting room" was the phrase that you heard over and over. And when you see these photos you realize just the opposite, that this community of Jews on South Beach, this shtetl, really were not waiting around to die. They were full of life. They were living. They were loving. They were dancing. WLRN: Tell us real briefly about Andy Sweet. SOKOL: Andy was working with another photographer -- with Gary Monroe. The documentary film "The Last Resort" really gets into the intimate relationship that these two photographers had. Gary Monroe was shooting black and white and [Andy] was shooting color, square format Hasselblad camera. They were taking a look at things through a different lens. Both men were determined to document this world that existed in the late 70s on Miami Beach, particularly on South Beach, because they knew that it wasn't going to last. They could see this happening. Did Andy try to pose the people in his pictures? What was his style? SCHOLL: The marked difference in styles between Gary and Andy, Gary was a classic photographer, very composed, thinking about every shot. And Andy was like "lift up, camera, crank button and move on." His shooting style was very casual and that worked to his favor. People really began to see them there all the time and began to kind of relax around them. Also you got to remember they were two nice Jewish boys who had grown up on Miami Beach. This was a culture that they were comfortable with. They were used to being around and it had a real impact on the kinds of photos that they took and who they took them of.